The other day I was wandering around the produce section the way an avid reader wanders the book store, thinking, “Hmmmm, what should I buy?” I was drawn in by a bountiful bunch of red kale. Because I am relatively new to the joys of kale I am not yet familiar with all of the varieties and their idiosyncrasies. But I love a challenge. I took a leap of faith that it might be more mild than your standard issue kale and that it could be used in a salad. 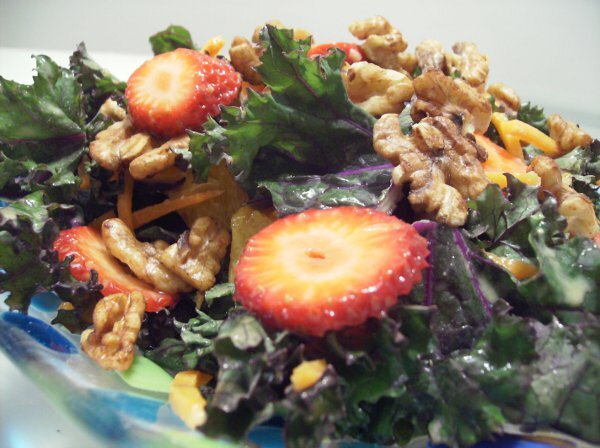 When I designed this salad I was visualizing the classic spinach and strawberry salad of yore. This is an homage to a legend. This salad is not for the faint of heart. It is significantly more substantial (read a workout to consume) than raw spinach, yet surprisingly lighthearted. The sweet and juicy fruit is the perfect companion to the meaty kale and tangy dressing. The bite of the Dijon offsets the barely bitter of the red kale and makes you want more and more. Toast walnuts in a dry pan over low heat. When they are hot, add 1 tsp of tamari to the pan and toss to coat. Remove pan from heat and let cool. As I sat there consuming this beast of a salad I couldn't quite put my finger on exactly what made me love it so much, just that I did and there you have it. It’s an enormous bowl of health and vitality with tamari toasted walnuts. Immediately upon finishing the bowl my insides felt giddy and my body felt happy. Kale is like an amphetamine. You are really going to love the colors and flavors of this salad. Easy to make with easy to find ingredients. Enjoy.